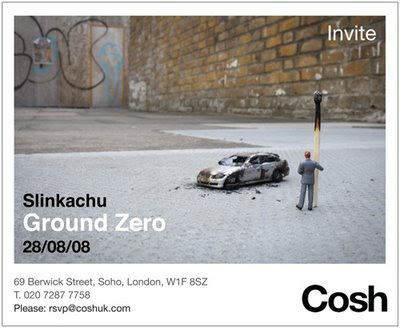 GROUND ZERO: Little People in the City is the first solo show from Slinkachu featuring all new works at Cosh Gallery, Soho. Slinkachu has taken street art to a new scale, painstakingly hand-painting tiny characters that live in a world that’s too small for us to always notice beneath our feet. His street installations are constructed in all sorts of public spaces, the portrayal of little lives that mirror our own. Working in miniature opens up the city landscapes in unexpected ways and this is explored in Ground Zero where he literally brings you down to a new level. Ground Zero is both street art installations and photography. The two go hand in hand with the subsequent photograph uncovering his hidden world. The show depicts the little fears and anxieties of city life and the general feeling of being alone or insignificant in a large city. While the scenes reflect the loneliness and melancholy of urban life there is always an underlying sense of humour and feeling of empathy.